Have you ever thought about visiting or even living in a place that could be described as “rustic”? Where there are no traffic lights, and where you can buy fresh lobster at less than $7 per pound? It’s a place where horses roam the streets and kids walk home from school using the airport runway as their sidewalk. A tranquil piece of terra firma where you watch the sun rise out of and set into the Caribbean Sea… Welcome to Big Corn Island, Nicaragua. My last 10 years in the workforce involved working and living outside the U.S., and I wanted to continue that traveling into retirement. I’m a man with a permanent place to call home and a wanderlust attitude. How do I satisfy both? Researching the Internet, I discovered housesitting—which has allowed me to live rent free all around the world. It’s simple: In return for free board, I perform some simple tasks for homeowners, ranging from watering the plants to managing some properties…something I did 45 miles off the coast of Nicaragua for three months in 2013. With the name “Big Corn Island,” you’d think there would be an abundance of corn. This is not so. 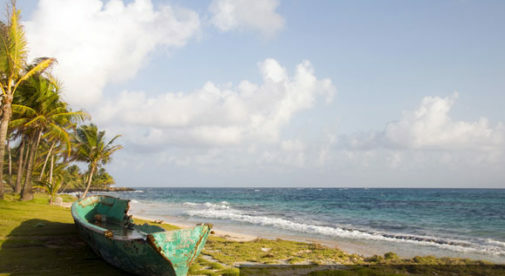 The four-square-mile island is covered with lush vegetation, surrounded by beautiful beaches, and inhabited by warm and friendly people. The total population is around 6,000. If you’re an early riser you’ll see spectacular sunrises with your coffee. If that’s too early, simply “go west, my friend,” grab a cold drink, pick your spot on the beach, and watch the sun retire. With the beginning and end of your day taken care of, you may want something to do in between. Why not take a walk along the wide beaches, swim in the warm waters of the Caribbean Sea, or socialize with the locals under a shade tree? On the other hand, you could simply find a secluded spot to read, nap, or reflect. My island assignment was different from most. In addition to minding the homeowners’ living space, I managed their two vacation-rental studio apartments. In managing these rentals and overseeing the daily upkeep of the property, I experienced life more as a local. Like many locals, my primary means of getting around was either a bicycle or walking. Taxis are available for $1 per person per stop—operating almost like a bus. The cost of food on the island is slightly higher than on the “main,” as islanders call mainland Nicaragua. However, in general, costs are still less than U.S. prices. Weekly, my food costs averaged about $30. I also ate at some local restaurants, where meals and a couple of drinks ranged between $15 and $20. My total food and drink cost for the three-month period was approximately $610. Fresh vegetables are available from the mainland on Fridays. Since there is no central farmers’ market, get to your favorite market early to get the best selection. Some vegetables are grown on the island but most are shipped in, so prices will vary a little. Fresh chicken, beef, and pork products are also available on the island, but again, most of it comes from the mainland. Seafood is the islanders’ primary source of meat, which they harvest directly from the Caribbean Sea. I started most of my days rising with the sun, walking a deserted beach, and enjoying breakfast to the sounds of nature. Before the sun reached its peak, I’d go to town for supplies or ride my bicycle around the island, occasionally stopping to talk briefly with some locals. The afternoon brought sunbathers and swimmers to the beaches. They seemed few, however, as many beaches are large. For those days I wanted to extend into nights, I’d visit one of the local bar/restaurants. There are several to choose from, most with waterfront dining and drinking. Since beginning my housesitting adventures in December 2011, I’ve sat homes in Costa Rica, Panama, Nicaragua, Puerto Rico, and the southeastern U.S. My assignments outside the U.S. have all been at least two months each, with my U.S. assignments averaging almost one month each. In fact, for the years 2012 and 2013, I only slept in “my own bed” for about six months each year, calling somewhere else “home” for the remaining six months.